Larry Taylor makes his way up the grueling Mount Spokane section of the Let's Climb a Mountain course. A line of runners in tutus, neon outfits and high school T-shirts are gathered at Riverfront Park underneath the Clock Tower. They aren't waiting for fireworks or a concert. They're stretching to prepare for a race across Spokane. And hopefully to the top of a mountain. This isn't your typical fun run. There isn't paint or mud or zombies — well, there might be a team dressed up like zombies, but that's not the point. Let's Climb a Mountain is a 34.3-mile race that begins and ends at two of Spokane's most iconic landmarks — the Clock Tower and the top of Mt. Spokane. This race has been challenging runners since 1980, and though its numbers have decreased, director Ron Nutkowitz hopes that people will realize how unique — and challenging — it is to Spokane and the Inland Northwest as a whole. While hardly as popular as Bloomsday or a number of other regional runs, Nutkowitz says it's a valuable event for the running community and community at large. "All of the profit from the race goes to the Greater Spokane League for kids who can't afford running shoes, or to help pay for other things teams may need," he says. "I would like to see this race expand so that we could do even more. We want kids to be able to run if they enjoy it, not only if they can afford it or if they're the best at it." The length of the course and lack of phone connectivity make the more than 70 volunteers who come together from organizations around Spokane crucial to ensure the race is safely managed. Trevor Carlson was introduced to Let's Climb a Mountain in 1999 when he was running for North Idaho College. "My friend Brad got a relay team together and we had a good time running it," Carlson says. "The challenge to it is that at about 21 miles, it keeps going up and up and gets steeper until the end." Even after moving to California four years ago, Carlson couldn't stop thinking about this race, so he got together a reunion team in 2013. "We all had a lot of fun again, and at the finish we were joking around and everyone was saying, 'Trevor you can do the whole thing solo next year, and we'll make a team and see who wins.'" In 2014, they did just that. Though Carlson felt familiar with the course, having run two separate legs, he had never run more than a 10k before. After a year of training, the end of the race presented him with a new challenge. Let's Climb a Mountain is one of the most strenuous events in the region and requires more than 70 volunteers (seen right) to pull off. 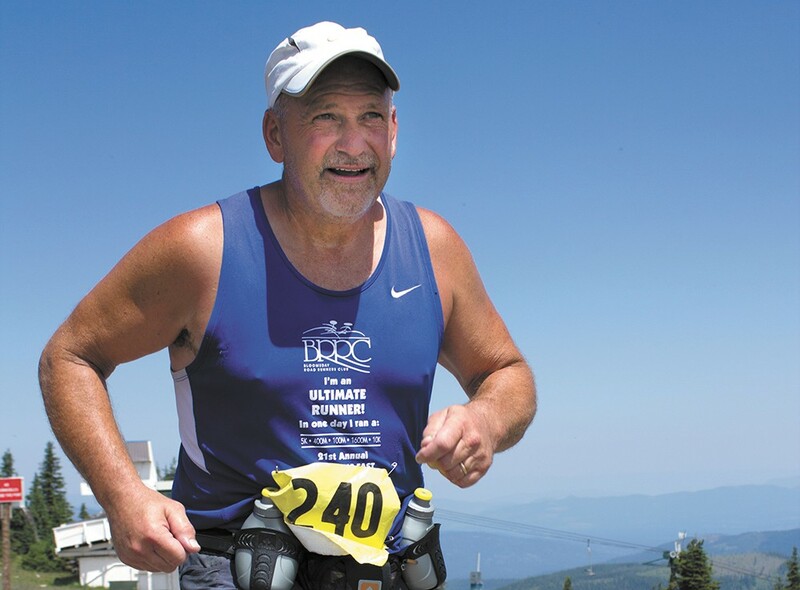 "In the last few miles, I realized that I could probably walk just about as fast as I was running and it wouldn't be as taxing, but every time I lengthened my stride to walk, my leg started cramping up," he says. Carlson, forced to continue with his shorter running strides, finished the race at 4:29:00, the best overall solo time of the 2014 race. Carlson's friends' team, which they named "Beat Trevor," edged him out with 4:20:48. Carlson's success at Let's Climb a Mountain last year is inspiring him to run a 100k in the Portland area next spring. "Even though I'm pretty devoted to training a little differently and my body will appreciate the break, my mind keeps wanting me to run [Let's Climb a Mountain] again," he says. Among the traditions surrounding the event is the hot dogs. "It's funny that we have hot dogs, because runners probably don't care for hot dogs — I'm a runner and I don't think I would want one after a race — but one year I didn't have them, and I definitely heard about it," says Nutkowitz. He encourages people to start their Saturday a little early by cheering on the runners at the Clock Tower, with solos beginning at 6 am and teams beginning at 6:30. The exchange points along the course also offer open views of the runners, specifically the second exchange point at Peone Road and Moffat Road. "These runners fly by pretty fast," Nutkowitz says. So helping them celebrate completing the race at the finish is another option.